Things were finely poised at the mid-way point of the 2014 Dunlop MSA British Touring Car Championship season. Heading to rounds 16, 17 and 18 at Snetterton in Norfolk there were just seven points separating Colin Turkington and Gordon Shedden at the top of the drivers championship, with Andrew Jordan, Jason Plato and Rob Collard in close contention also. At the head of the field in Norfolk it was MG KX Clubcard Fuel Save setting the pace, as Plato scored pole position and a superb double victory in the first two contests. The weekend, however, was a significant turning point for one of the contenders – reigning champion Jordan. Following his sensational start to the year, Jordan looked odds-on to be in the hunt to retain his hard-fought crown, however a small mistake was to be very costly for the Honda driver in Free Practice One. An error on the way into the fast first corner spent the Pirtek Racing car spearing backwards into the barriers at high speed. Jordan walked away from the incident, however he later exhibited signs of concussion and was taken to hospital as a precautionary measure. This left the 25-year-old unable to take part in qualifying and meant that if he was passed fit, he’d have to start the first race of the day on Sunday from right at the back of the grid. Jordan was indeed cleared fit to race as Sunday dawned, and made impressive progress from 31st to 16th in the first BTCC battle of the day. Race two was a more frenetic affair for the reigning champion, and as he fought hard to get into the top ten a three-car clash involving Jack Goff and Rob Collard sent his car spinning off the track. While he was able to recover the car and score a championship point finishing 15th, Jordan was clearly physically exhausted following the encounter, and on further examination from the BTCC medical team it was decided that he should not contest the final race of the day. Jordan made a full recovery from the weekend, but his championship challenge had taken a big blow. 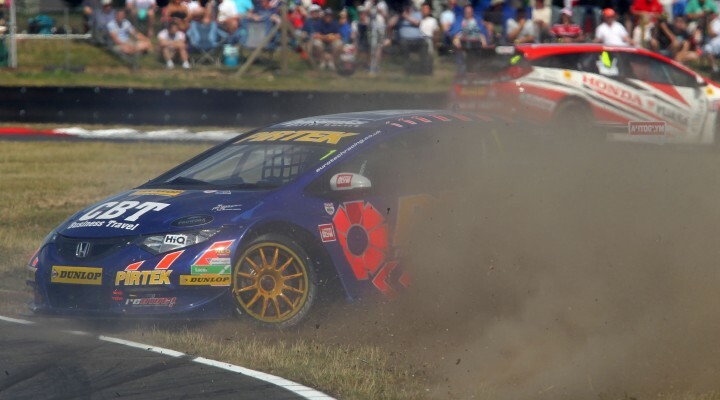 Indeed the midlander knows better than anyone the importance of scoring consistently in the BTCC having only had one non-finish in his entire championship-winning campaign, so to come away from Snetterton having scored just a single point made the second half of the season a tough fight. Jordan soon returned to the consistent form that gave him the 2013 crown, and for the final three events he was never outside the top ten.